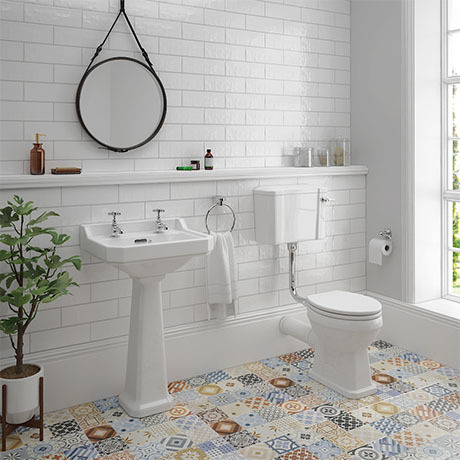 The classical Carlton traditional low level bathroom suite, ideal for creating a luxury period looking bathroom, includes a 2 Tap Hole basin and pedestal set and low level traditional WC pan & cistern. Manufactured from high grade vitreous china in a beautiful white gloss finish. Supplied with a Traditional ceramic cistern lever and white wooden toilet seat. Create your dream traditional bathroom with the Carlton toilet and basin suite. Please note - taps + waste not included (sold separately).